We’ve been following the renewed seismicity in the northern Zagros with great interest, including the recent Mw 6.3 and Mw 5.7 earthquakes on 25th November and 16th January. These events occurred in the general area of the Khanaqin lineament that is broadly coincident with the SE margin of the Kirkuk embayment in NE Iraq and the western limit of the Lurestan promontory in the Iranian sector of the Zagros. The seismic catalogue records a wide variety (spatially and temporally) of right-lateral strike slip, oblique-slip and thrust displacements. This underlines the complexity of active tectonism in the area, and is consistent with strain partitioning in a right-lateral transpression belt – it also has major implications for exploration and production in the region! Hopefully we’ll get chance to present this in more detail at the upcoming EAGE Annual Conference in London in June. [Update – we’ll be presenting this work at EAGE: “The Influence of Regional Tectonics on Trap Integrity in Zagros Foothills and Foreland, Kurdistan and SE Turkey”, as part of the “Basin Evolution: Structure, Sedimentation and Economic Geology” morning session on Wednesday 5th June]. Recent seismicity in SE Kurdistan and the Lurestan region of Iran. 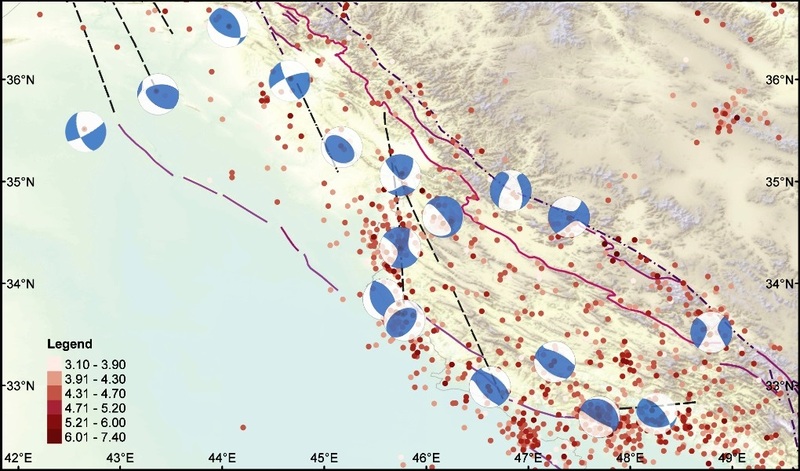 Focal mechanisms and moment tensor interpretations of larger earthquakes suggest a wide variety of thrust, strike-slip, and oblique-slip displacements. Seismicity data: https://www.globalcmt.org and https://earthquake.usgs.gov. Coordinate system: WGS84. Background topographic data: ESRI, USGS, & NOAA.